The Arkadian messenger god. Known in Roman mythology as Mercury. He was the son of Zeus and Maia, born on Mount Cyllene. He was the father of Echion, Autolycus and Daphnis, and, by some accounts, of Pan. He was a deity of travel, trade, commerce, ingenuity, manual skill, athletics, eloquence and oratory, of the wind and of speed; the patron of shepherds, herdsmen, athletes, orators, writers, thieves, merchants, travelers, prophets, soothsayers and magicians. Hermês corresponds to the Egyptian god Thoth or Tahuti, as the inventor of writing; and, as Hermês Psychopompos, to Anubis as guide of the souls through the underworld. Hermês is also the god of stones, cairns and boundaries, and was associated with certain phallic stone monuments called herms. Hermês was usually depicted as a youthful, athletic male deity, unclad or clad only in a short chlamys, with a round, winged hat and winged sandals, and bearing the Caduceus (a rod, sometimes winged, with twining ribbons or snakes) and a pouch. One Latin title for Hermês was “the universal column supporting all things.” His sacred animal was the crane. Hermês is often portrayed as a prankster, his most famous prank being the theft of Apollo’s cattle on the day of his birth. When Apollo discovered the theft, Hermês placated his anger by offering to return the remaining cattle (he had sacrificed two of them to the twelve gods, including himself), and singing Apollo’s praises while accompanying himself on the lyre, which he had just invented. Apollo was so taken with the beauty of the music, that he offered to trade the stolen cattle for the lyre. Hermês accepted the offer; then cut some reeds, bound them together and played a few more tunes for Apollo on his newly-invented shepherd’s pipe. Apollo was again enchanted by the music, and offered to trade his golden herdsman’s staff for the pipe. Hermês reluctantly accepted the offer, but only on the condition that he be instructed in the art of prophecy as well. Apollo took Hermês to Olympus, where Hermês was accepted among the gods. Despite his malicious pranks (or, perhaps, as a result of them), he was the only one of Zeus’s illegitimate children who immediately found favor with Hêra. Zeus proclaimed him his personal herald, and invested him with the insignia of his office: his round hat, his winged sandals, and a winged herald’s staff twined with white ribbons. Hermês pledged that, as herald of the Most High, he would give up telling lies; but he could not promise always to tell the whole truth. Hadês also proclaimed Hermês his herald, to summon and conduct the souls of the dying to the underworld. As a sign of Hermês’s association with Hadês and his role as Psychopompos (conductor of souls), the white ribbons on his herald’s staff were transformed into twining serpents, the ancient emblem of dead souls. Hermês developed the musical scale, and assisted the three Fates to compose the Alphabet. He created the science of Astrology, founded the arts of boxing and gymnastics, invented weights and measures, and taught the cultivation of the olive tree and the making of fire by the twirling of a fire-stick. Hermês as a Saint of E.G.C. may also refer to Hermes Trismegistus or Thrice-Greatest Hermes, the legendary Egyptian founder of Hermeticism, corresponding to the Egyptian god Thoth. 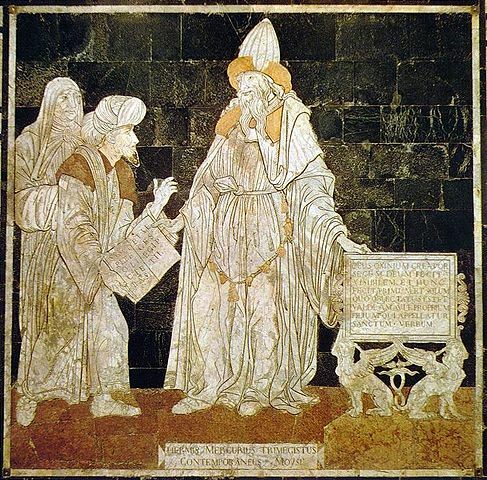 Hermeticism was a non-Christian form of Gnosticism which emerged in Egypt in the second through fourth centuries e.v., and which produced a voluminous body literature called the “Hermetica,” including the Tabula Smaragdina or Emerald Tablet of Hermês which is the source of the famed magical aphorism, “As above, so below”; and The Divine Pymander, which is included in Section 1 of the A:. A:. reading list. Hermeticism had a considerable influence on the development of Alchemical philosophy.